Encore! opened a fine arts gallery in the Old Sandstone building at 122 S. Wesley, on the campus uptown in Mt. Morris, IL. 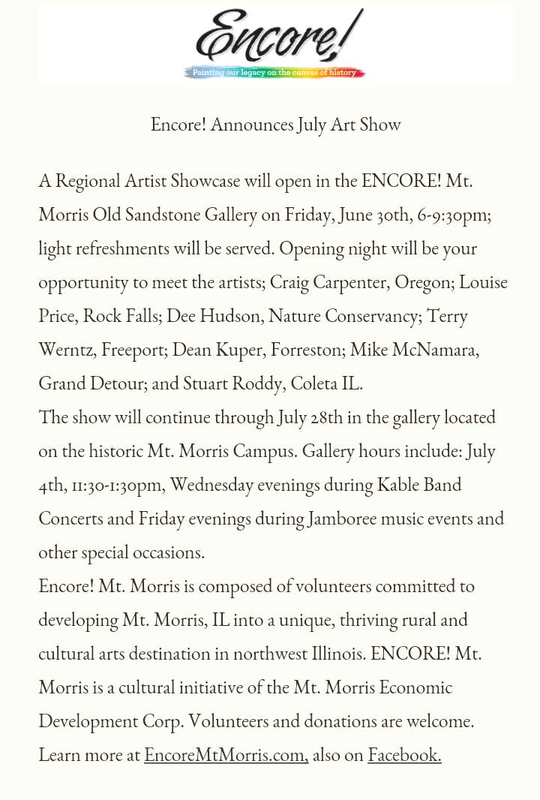 The first floor gallery opened to the public on Friday, July 15th,2016 from 6:30 to 9:30 p.m. and feature six northern Illinois artists, including local sculptor Jeff Adams and Mt. Morris alum Andria Thorngren Burchett. 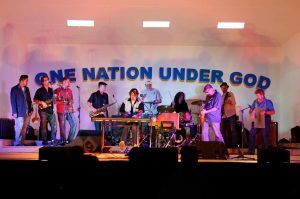 The gallery opened on the following Fridays, July 15, 22, 29 and August 5, to coincide with Jamboree Music at the bandshell next door. Several events have happened since. Steering, with Jeff Bold as chair, has welcomed a communications group merger and together are supporting the mission of Encore!. We are on the web at: www.encoremtmorris.com, have printed promotional material, and continue building the structure under Encore! Mt. Morris. Beautification, lead by Mary Jane Warkins, continues existing efforts and expands to include larger scale projects with an overall vision of melding our past with the future. Small Business, under the leadership of Doug Aken and Rob Urish, are meeting monthly. The future is exciting with a great group of Encore! participants engaged in the process. 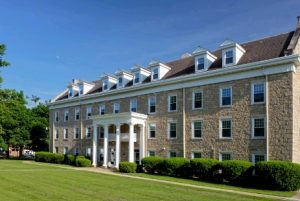 Infrastructure, lead by Cory Buck and Ted Gesin, have begun the task of evaluating uptown and campus buildings. Paul Peterson has worked out a system for formatting the results. These efforts are serving as a resource for other Encore! initiatives. Tourism, under the direction of Sally Gray, has combined with the existing Mt. Morris Tourism group. They are meeting regularly on tourism opportunities and researching Historic Preservation. Arts Center, lead by Molly Baker, is one of the most visible with the opening of our Encore! fine arts gallery. The efforts of Molly and her group in organizing such an ambitious effort opens the Encore! vision to the greater community. We have partnered with existing mission related, autonomous organizations including Performing Arts Guild (PAG) and Rural Community Pavilion (RCP) on performing arts and education projects. PAG was the first funding donor to Encore! paying forward a gift of $1,000 to help seed our initial activities. RCP is researching local Community College resources for education support. Over 100 pieces in our 2017 Student Show are on display. Juried Art Show (featuring regional artists), Sept 1-29. Opening: Sept 1, 6-9:30pm. “It was a little village of 2,500 people,” said artist Fran Volz. “They had a brewery and this.” “This,” to Volz’s amazement, was a straw sculpture competition that draws thousands of visitors to the village of Höchenschwand in southern Germany. It inspired the artist to create his own a straw sculpture, resulting in an impressive 21-foot tall replica of the Statue of Liberty. 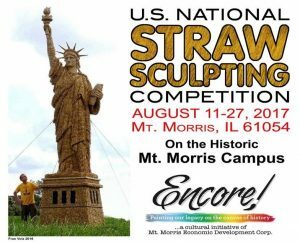 In 2016, Rochelle hosted the first ever U.S. National Straw Sculpting Competition. In 2017, the competition will find it’s permanent home in Mt. 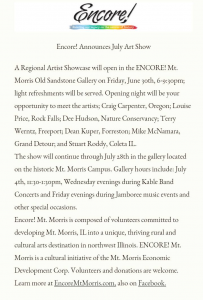 Morris, Illinois, where Encore! Mt. 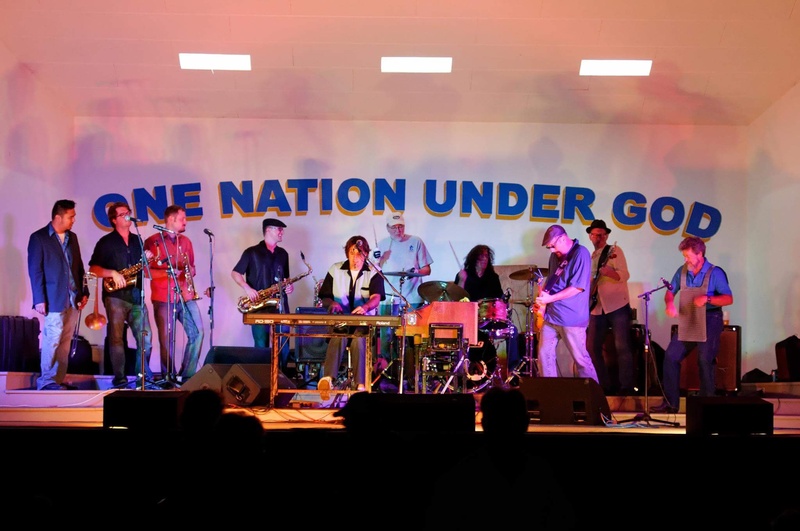 Morris is adding this fine arts event to a growing cultural calendar. Encore! Mt. 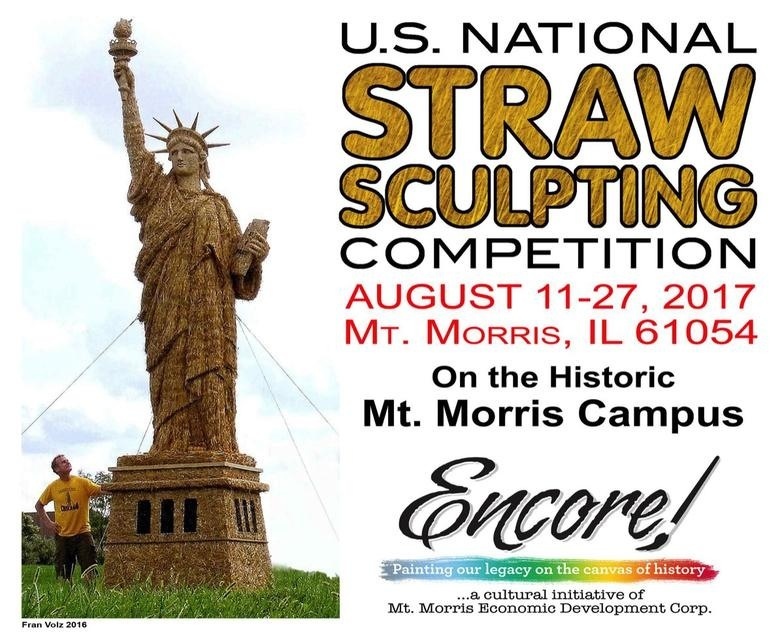 Morris will host the U.S. National Straw Sculpting Competition August 11–27 on the former college campus in the center of Mt. Morris. The community development group is working closely with Fran Volz to retain his vision of the contest while expanding it to include more artists and student groups. Details about the upcoming competition, photos of the 2016 sculptures, and more about Volz’s process for creating straw sculptures can be found at StrawUSA.com. Encore! Mt. Morris is a cultural initiative of the Mt. Morris Economic Development Corporation. Composed of volunteers, it’s committed to developing Mt. Morris, Illinois into a unique, thriving rural and cultural arts destination in northwest Illinois. Donations to Encore! Mt. Morris are tax-deductible and can be made through the Village of Mt. Morris. Please make checks payable to the Village of Mt. Morris, with “Encore” on the Note line.